You just knew that the Houston Rockets weren't going to remain silent with the trade deadline less than 24 hours away. Some wing depth has been added as the Rockets have acquired Iman Shumpert, Nik Stauskas, and Wade Baldwin, first reported by Adrian Wojnarowski of ESPN. This will be a three-team trade between the Rockets, Sacramento Kings and Cleveland Cavaliers. 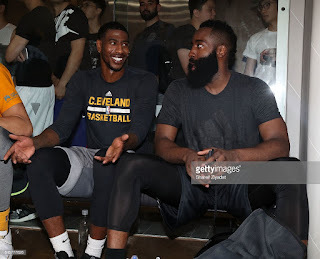 As a result of this deal, the Rockets will be acquiring Shumpert and sending Brandon Knight, Marquese Chriss and a 2019 lottery protected first-round pick to the Cleveland Cavaliers. Also, Alec Burks and a second round pick will be sent to Sacramento. It was inevitable that Knight and Chriss were going to be traded. Neither had panned out in Houston and Chriss recently requested a trade from the organization. While there was some optimism Knight could bring some guard depth to Houston following a knee injury, it simply did not happen. With there being much less pressure to produce in Cleveland, it could be a better situation for both Chriss and Knight. This trade also makes sense from a salary cap standpoint. Houston will dodge the luxury tax and save future money with Knight's contract off the books. Shumpert, Stauskas, and Baldwin are all currently on expiring deals worth $11 million, $1.6 million, and $1.5 million, respectively. With most of the money centered around James Harden, Chris Paul and Clint Capela, acquiring key role players at a low value is a priority for General Manager Daryl Morey. The Rockets will be the fourth stop of Shumpert's career. His previous stints have been with the New York Knicks, the Cavaliers and, obviously, the Kings. Shumpert was a key role player on the Cavaliers' championship squad from 2016, and he has had somewhat of a revival with the Kings by taking advantage of an increased role. He's currently shooting 36.6% from the arc on 4.8 attempts per game, and he has a defensive reputation that fits the 3-and-D type mold the Rockets covet. Woj also reported that Nik Stauskas and Wade Baldwin will head to Houston as part of the deal. Both were recently traded to Cleveland as part of the Rodney Hood deal, and it's currently unclear how they'll fit in (if at all) with the Rockets. Stay tuned to Red Nation Hoops for trade deadline updates.